Preheat the oven to 350°F. Combine the yogurt, cream cheese, egg product, sugar and lemon zest in a bowl and beat on high until smooth. Fill the mini graham cracker crusts and then bake for 20 minutes, then let cool. To make a flaming presentation: Cut a hole in the strawberries... not all the way through! Then fill with Bacardi™ 151 and light on fire. Remember to be VERY careful when doing this!! The flame can be tricky and sometimes it’s lit even if you can’t see it. Also, always blow out the flame for your guests and let the strawberry cool. Yes, the title speaks for itself... they are flaming, but you DON’T eat them flaming! That’s just for presentation! Phew, just thought I should get that out of the way before I explain how delicious these are. 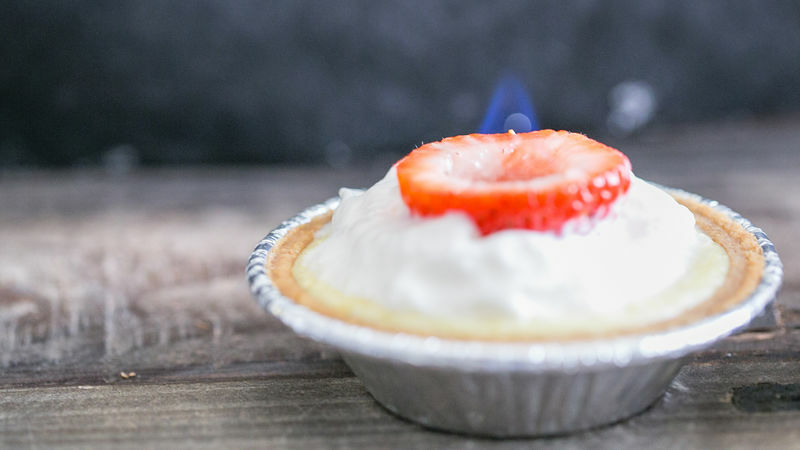 Honestly, if you’re making a dessert for an event, BBQ or summer party Flaming Strawberry-Lemon Mini Cheesecakes are the ones to make. They’re incredibly easy and super tasty (I had two in one sitting... oops!). The lemon yogurt and cheese make the perfect combination. You can buy pre-made, mini graham cracker pie crusts at the store and the rest is a breeze! So you’re probably wondering about the flaming part... it’s a cool added touch if you’re bringing them out on a tray to serve to guests. Pretty simple to create too! You just cut a little hole in the top of the strawberry, fill it with Bacardi 151 and then light it! Just be SUPER cautious as sometimes the flame can be hard to see. You always want to warn your guests that it is in fact “on fire”. And if you feel like skipping that part, these little pies don’t need to be lit on fire to be a hit. They’re tasty without the fanciness.